ISIS has claimed responsibility for a rocket attack which has seriously damaged an Egyptian navy ship anchored in the Mediterranean Sea. Its claim to the attack came from a number of Twitter accounts known to be controlled by members of the militant group. 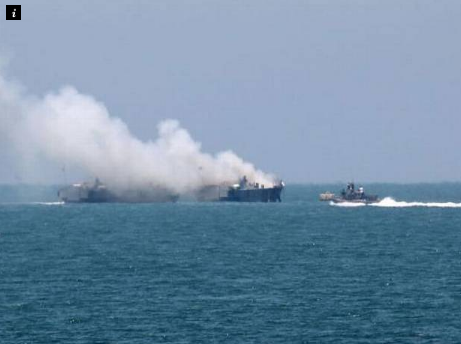 A spokesman for the Egyptian military, Brigadier General Mohammed Samir said the vessel caught fire during an exchange of fire with "terrorists" on the shore, and said no crew members were killed. He did not specify the extent of the damage, but security officials said that a number of crew members suffered injuries during the attack, and several jumped overboard to escape. The attack is said to have come from an Egyptian branch of Isis, the so-called Sinai Province of the Islamic State. Previously an independent group, last year they pledged their allegiance to Isis, and have carried out a number of attacks against Egyptian military targets since. The attack occured off the coast of northern Sinai, an area at the east of Egypt that borders Israel and the Gaza Strip. The authenticity of the claim can not yet be immediately verified, but the Twitter posts were accompanied by pictures apparently showing a rocket flying toward the vessel, followed by a large explosion engulfing it. Security officials said the vessel regularly patrols Egyptian waters, and is sometimes used to transport military and public personnel to the mainland. This claimed attack on Egyptian military forces comes not long after another attack by Isis's affiliate in the country on 1 July, when at least 17 soldiers were killed by armed militants.